For our story today, we're going to go back a few years, as we frequently do. How many years? Well ... how about 3,000! Now wait a minute. Dave has been around a while, and has had plenty of experiences, but 3,000 years is a bit much even for him. But yes, that's where we are going today. First though, we make a stop about 20 years ago; I was in the early stages of my project to create the 100 prints of the Hyakunin Isshu series. As part of my attempt to have my collectors understand more about the work they were receiving, I created a seasonal newsletter to talk about my activities. (This is still running today.) In the early issues of the publication, I wrote a regular column introducing some of the craftsmen who created the tools and supplies that I was using. One such was the man who made the blades for my carving knives. His workshop was up in Niigata, and one day I went up there to visit him, both to get acquainted, and to gather material for a newsletter story. He seemed happy to have visitors (I had my family with me), and took plenty of time out of his schedule to show us his work and answer my questions. But his hospitality didn't end there, as he took us on a 'tour' of his town, showing us many points of interest. One such stop on the tour was a place in which he himself had plenty of interest, but which on the face of it didn't seem like much - it was just a bare field, with some ditches and holes dug in it. I instantly recognized what it was - an archaeological excavation - and would happily have spent more time there with him learning about what was being discovered, but my kids (pre-schoolers at the time) were understandably not particulary impressed, and we soon moved on. He was an excellent host, and made our day there well worthwhile. We then returned to Tokyo, and the newsletter story I wrote seemed to please him, because he maintained contact for many years after that, often sending me small presents - some knives from his collection, or other items for my work. One day though, a package arrived with some rather different things inside. I have it here beside me now - a small cardboard tray containing five pottery shards. They are quite uniquely shaped, and are clearly identifiable by the patterns they carry. They are from the Jomon era, and are at least 3,000 years old, and possibly quite a bit more than that. When you hear this story, your reaction may possibly be the same as mine when I first opened the package. "No! We can't just take such things from an excavation site!" When a layman messes around with such material, moving it from where it is found destroys all the context that comes with knowing which soil layer it was in. By digging these things up and sending them to me, my friend was not helping the cause of archaeological science! And was perhaps committing a crime to boot. When I called him up to (sort of) thank him, and to address these issues, he brushed off my fears. He told me that the scientific teams working on this site (and other similar places) had found a good way to at least partially alleviate such concerns. One small corner of that site was designated as a 'Citizen's Dig' section, and anybody was free to conduct their own excavations, and to keep whatever they found, with the proviso that they show everything to the archaeologists before taking it home. 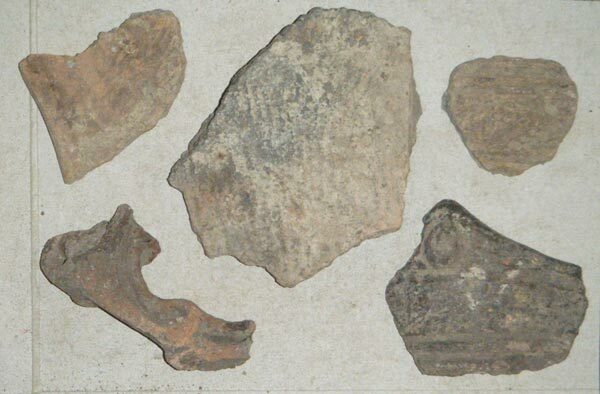 Jomon pottery is not that rare, and the scientists certainly don't need to keep every last small fragment that is found. They are interested in the bigger picture, and by letting the residents of the area dig freely in that one spot they preserve the integrity of the rest of the site, which otherwise might be over-run by people looking for souvenirs. At least that is the story I was told, and I certainly hope it is true! And as a footnote I might mention that having this little collection in my home helps keep me a bit humble. I'm forever telling interviewers about how my prints will last such a 'very long time ... around 200 years'!